By default, a switch will forward a broadcast or multicast out all ports, excluding the port the broadcast/multicast was sent from. When a loop is introduced into the network, a highly destructive broadcast storm can develop within seconds. Broadcast storms occur when road casts are endlessly switched through the loop, choking off all other traffic. In the above structure If the computer connected to Switch 4 sends out a broadcast, the switch will forward the broadcast out all ports, including the ports connecting to Switch 2 and Switch 5. Those switches, likewise, will forward that broadcast out all ports, including to their neighboring switches. The broadcast will loop around the switches infinitely. In fact, there will be two separate broadcast storms cycling in opposite directions through the switching loop. Only powering off the switch or physically removing the loop will stop the storm. Switches (and bridges) needed a mechanism to prevent loops from forming,and thus Spanning Tree Protocol (STP, or IEEE 802.1D) was developed. STP is enabled by default on all VLANs on Catalyst switches. STP-enabled switches communicate to form a topology of the entire switching network, and then shutting down (or blocking) a port if a loop exists. The blocked port can be reactivated if another link on the switching network goes down, thus preserving fault-tolerance. 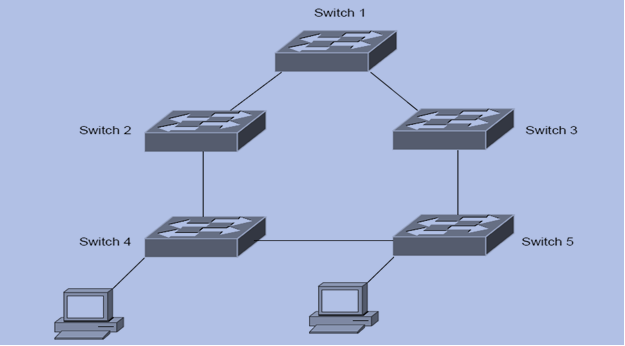 Once all switches agree on the topology database, the switches are considered converged. • Common Spanning Tree (CST) –A single STP process is used for all VLANs. • Per-VLAN Spanning Tree (PVST) – Cisco proprietary version of STP, which employs a separate STP process for each VLAN. • Per-VLAN Spanning Tree Plus (PVST+) – Enhanced version of PVST that allows CST-enabled switches and PVST-enabled switches to interoperate. This is default on newer Catalyst switches. Ø If a loop exists, a port is placed in Blocking state. If the loop is removed the blocked port is activated again. If multiple loops exist in the switching environment, multiple ports will be placed in a blocking state. The first step in the STP process is electing a Root Bridge, which serves as the centralized point of the STP topology. Good design practice dictates that the Root Bridge be placed closest to the center of the STP topology. The Root Bridge is determined by a switch’s priority. The default priority is 32,768, and the lowest priority wins. In case of a tie in priority, the switch with the lowest MAC address will be elected root bridge. The combination of a switch’s priority and MAC address make up that switch’s Bridge ID. Remember that the lowest priority determines the Root Bridge. Switches 2,3, and 5 have the default priority set. Switches 1 and 4 each have a priority of 100 configured. However, Switch 1 will become the root bridge, as it has the lowest MAC address. Switches exchange BPDU’s to perform the election process. By default, all switches “believe” they are the Root Bridge, until a switch with a lower Bridge ID is discovered. Root Bridge elections are a continuous process. If a new switch with a lower Bridge ID is added to the topology, it will be elected as the new Root Bridge. than the priority of the other switch. the switch’s priority to 28,672.
seven switches deep, from the Root Bridge. timers are tuned specifically to the diameter of the switching network.